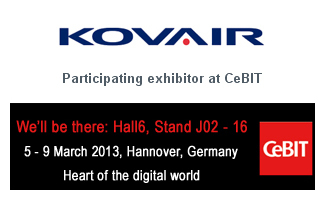 Kovair 7.0, new enterprise bus-integration product and ALM solution on cloud are all set to be on display at CeBIT 2013 by Kovair Software Inc.
Feb. 26, 2013 - PRLog -- Kovair Software Inc. the pioneer in Application Lifecycle Management - ALM and IT Service Management - ITSM solutions, is all set to participate in CeBIT 2013 to be held from 05 to 09 March 2013, in Hannover, Germany. Considered to be one of the top events in the digital world, this German trade fair provides the perfect platform for showcasing vivid IT and telecommunication solutions. Apart from highlighting the latest innovations and trends in ICT sector, the event has also gained popularity for offering interactive formats and targeted investment opportunities. Kovair will bring forth its new line of developments in ALM Studio, ITSM Studio and Omnibus Integration Platform to a larger audience. “We are expecting that this conference will give the right exposure to our latest innovations. We are confident about tapping new markets, expand our operations and contribute to the ongoing development in the IT Services and automation industry”, said Mr. Bipin Shah, Chairman and CEO, Kovair. “Europe has always been a great market for ALM and ITSM products and with emerging economies of Eastern European countries joining the league, there will be more opportunities for people who are in this business,” added Mr. Shah. Riding high on the hope that the latest UI release Kovair 7.0 for Enterprise-Class ALM and ITSM products will strike a chord with more and more audience in CeBIT 2013, Mr. Shah also mentioned, “The UI of Kovair 7.0 is more user-friendly, feature-rich and offers better navigation and content organization”. As a core IT engineering solutions provider, Kovair has already formed alliance with some of the top names in the industry and offering integration solution for diversified platforms. Be it CeBit 2013 or any other similar conference, Kovair’s products are sure to shine and attract new audience in the coming days.